As the title suggests I have just been to lazy to post for quite a while . That does not mean that there has not been much happening. For this post I will show a few pic's of a all wheel pick up I have done to a DJH 442 loco I purchased a few years ago already done . I installed a NCE decoder to it but as we all know the standard pick up is fairly average to say the least it would barely run , so it has sat in the storage yard for a while . 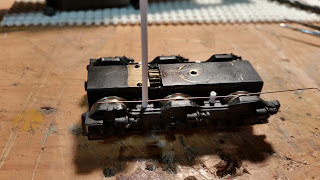 The other night I had a look to see if I could convert to all wheel pick up , with the bogies being all metal trying to nut out which way to do it I came up with the following , drill & tap the bogies on the side frame supports that come out from the main body to 2mm and using 1/16 styrene rod I drilled a 15 thou hole about 4mm up from the bottom then threaded it into the 2mm tapped hole then snipped off to length . After repeating on all 8 holes I inserted 15 thou phosfer bronze wire through the holes so that there was slight pressure on the tops of the wheels . 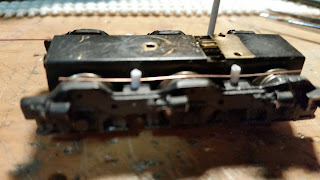 Then soldered the wires to the decoder pick ups on the wire. Well next was the big test on the layout to see if it would work ! WOW what a difference the loco now runs like a dream well worth the effort . Hopefully the few photos below help explain a bit better. all that is left to do is paint the syrene rod black . Just a few photos from my trip down to the main south last week. The next few are of the combo of double 81's 8101 & 8184 not that often you get the first & last of a class together ! All the above photos were taken on Wednesday evening in about 2 hours not a bad way to spend a few hours. At the recent Liverpool exhibition I purchased 2 InFront McWilliams Wine tankers .I am currently about 2/3 rds of the way through constructing the 1st kit.This in my opinion an excellent kit,all instructions are well written & the photos of the completed kit & prototype are of great assistance.The main part to get right is the stand offs, if these are out the whole wagon will not go together properly,but taking time & patience as with any kit the end product is quite rewarding. I also purchased another 2 Auscision 422's & 1 pack or Eureka NSSF sheep wagons. This brings the current Auscision 422 roster to 6.Only another 4 sound decoders to now buy. Now on the layout front the track laying on the Gunning section is now nearly complete & wiring is about to start,so hopefully in the next few weeks i can run trains around the whole layout. After the many hours spent looking on the internet and thinking that I had viewed all the photos & info about Gunning when the other night I Googled "nswgr upper & lower quadrant signals" & up came this web site http://vrhistory.com/walks/Gunning/Gunning.htm, well worth a look , plenty of photos of the now long gone signalling & yard layout. Now just a quick word on the layout progress , the track work on the lower deck for Dalton station is just about complete & wiring is not far behind , over the weekend I made up the Gunning section base boards & last night started to install the risers. I am hoping in the next few weeks to have the track laying done and wiring on the whole layout so train running can commence. As the title suggests this post is about the 3rd attempt (and last) for the frame for the Gunning section of the layout.The 1st was dismantled when the decision was made to raise the height of the layout so i could have the upper deck as the main line & the lower as the branch line.The 2nd was dismantled when the frame was to wide to reach the rear section on the upper deck & the lower was to narrow & not high enough to fit in the S008 silo (all my stuff ups) .So the 3rd attempt has been constructed.The same method has been used as the centre section of the layout.This has got to be cheating !,a mate of mine is a kitchen cabinet maker.He came over & measured up the area,then constructed it all in his factory.The main frame is 42 X 19 pine,legs 70 X 35 pine & the backdrop on the lower deck is 16 mm custom board which also is the main strength in the frame.We installed it last Saturday after noon & now i have to find the time to get cracking on track laying.I have been tossing -up the idea of using extruded foam as the base board & laying the track directly onto the foam instead of using ply on risers as the base,still undecided on this though. All in & done the lower deck is 400 mm wide & the top is 800 mm,the upper & lower decks will loop round at the far end to connect to the centre section. 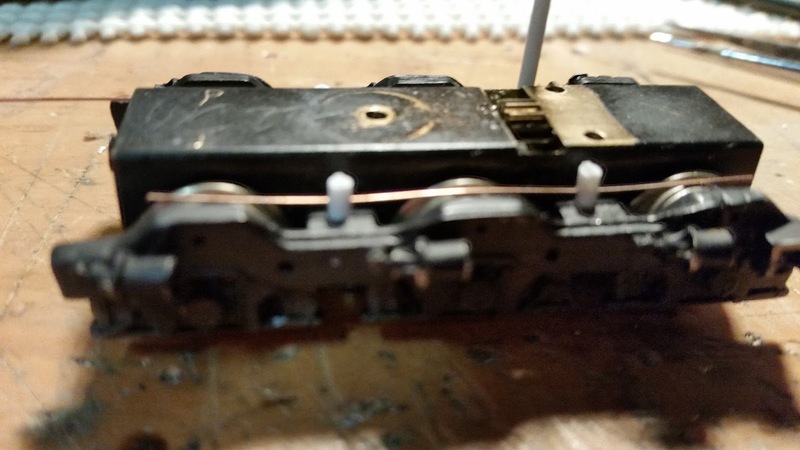 I am always looking for the little detail things that really make a layout look even more like the real thing and lately i have been looking at level crossing gates.So a bit of research and i decided to make some basic steel tubing gates for the lower deck branch line. I started with a drawing on paper of a 14 ft X 4 ft gate, then using large track tacks i pinned it to a off cut of 42 X 19 pine.Then i also used pins to mark out where the bends are for the center.On the top & lower corners i used drill bits to bend the wire(which is 20 thou phosphor bronze) to make up the main frame.Soldered all together and i am quite happy with the end product,just a coat of white paint and some timber posts to complete.A quick little project that will make the level crossing look good.Now to finish off the scenery so i can place it on the layout. Well i got my laptop back from getting repaired today so i better do a blog update. I have been experimenting with LED strip lighting for the layout on the lower deck.First i purchased a strip of 3528 warm white,this was too dull so the next one i got was a strip of 5630 led's i thought were warm white but they were white and they just don't give the desired light i am after too bright and give off a too pure white So i went to jaycar and purchased a DC regulated power supply box which is rated at 20 amps max and a p.w.m dimmer.This gave me the ability to dim the led"s but i am still not happy with the light colour so ill be back on ebay in the next few days to get some warm white strips. Next i have been moving along with the scenery on Grabben Gullen station & surroundings,I have used extruded foam this is a lot easier to work with when compared to the usual white polystyrene (still mess but no little white balls sticking to everything) i have been using a cheap electric kitchen knife to cut out the basic shape and then using a serrated knife to do the final shaping,i will still cover with a thin layer of plaster before any ground cover goes on. I have also been adding a few more decoders to my latest loco additions,the 2 lok sound decoders i fitted to my 422's sound great.I added LED lights to a Austrains C class & 80 an easy operation when you don't make the mistake of wiring up the led's back the front. Not train related but i was my 3rd son Aaron's 2nd birthday today, and lets just say he enjoyed his chocolate birthday cake !